Boxty is a traditional Irish potato pancake. The dish is mostly associated with the north midlands, north Connacht and southern Ulster, in particular the counties of Mayo, Sligo, Donegal (where it is know locally as Poundy or Poundies), Fermanagh, Longford, Leitrim and Cavan. 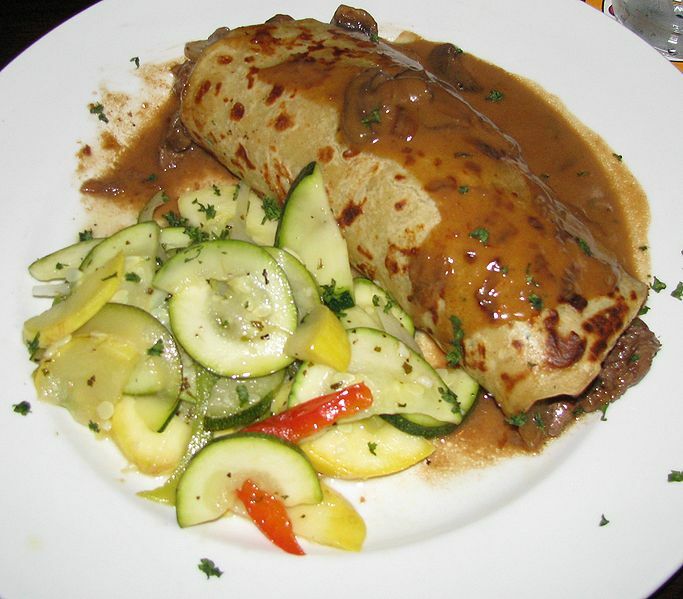 Left: Boxty, served with beef and squash. There are many different recipes but all contain finely grated, raw potatoes and all are served fried. The most popular version of the dish consists of finely grated, raw potato and mashed potato with flour, baking soda, buttermilk and sometimes egg. The grated potato may be strained to remove most of the starch and water but this is not necessary. The mixture is fried on a griddle pan for a few minutes on each side, similar to a normal pancake. Traditional alternatives include using only raw potatoes, boiling it as a dumpling or baking it as a loaf. The most noticeable difference between boxty and other fried potato dishes is its smooth, fine grained consistency. Some modern recipes use garlic and other spices to flavour the mixture. For hygiene and convenience, the raw potato may be blended in a food processor instead of grating it by hand.